Sensirion: At this year’s electronica 2018 in Munich (November 13-16), Sensirion, the expert for environmental and flow sensor solutions, will showcase its latest innovative sensor solutions. The SPS30 particulate matter (PM) sensor is the next technological breakthrough in optical PM sensors. Its measurement prin-ciple is based on laser scattering and makes use of Sensirion’s innovative contamination-resistance technology. This technology, together with high-quality and long-lasting components, enables accurate measurements from its first operation and throughout its lifetime of more than eight years. In addition, Sensirion’s advanced algorithms provide superior accuracy for different PM types and higher-resolution particle size binning, opening up new possibilities for the detection of different sorts of environmental dust and other particles. With dimensions of only 41 x 41 x 12 mm3, it is the perfect solution for applications where size is of paramount importance, such as wall-mounted or compact air quality devices. CMOSens® Technology for IR detection enables highly accurate carbon dioxide measurement at a competitive price. 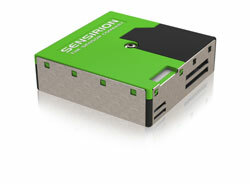 Along with the NDIR measurement technology for CO2 detection, a best-in-class Sensirion humidity and temperature sensor is also inte-grated on the same sensor module. Ambient humidity and temperature can be output by Sensirion’s algorithm expertise through modeling and compensation of external heat sources without the requirement for any additional components. Thanks to the dual-channel principle for the measurement of carbon dioxide concentration, the sensor compensates for long-term drifts auto-matically by design. The multi-pixel gas sensor platform SGP creates new possibilities for the measurement of indoor air quality. The SGP offers a complete gas sensor system integrated into a very small 2.45 × 2.45 × 0.9 mm3 DFN package featuring an I2C interface and fully calibrated air quality output signals. Sensirion’s MOXSens® Technology provides the SGP with an unmatched robustness against contamination by siloxanes resulting in unique long-term stability and accuracy. The SGP further combines multiple metal-oxide sensing elements − the pixels – on one chip to provide more detailed air quality signals. The unprecedented combi-nation of long-term stability and multi-pixel technology makes the SGP a perfect choice for indoor air quality monitoring in mobile, smart home and appliance applications. One of the hallmark features of Sensirion products is the use of its patented CMOSens® Technology, which permits intelligent system integration of the sensor element, logic, calibration data and a digital interface on a single chip. Sensirion's credentials as a reliable supplier are underscored by its loyal customers, quality reputation (ISO/TS 16949) and top customer pedigree.